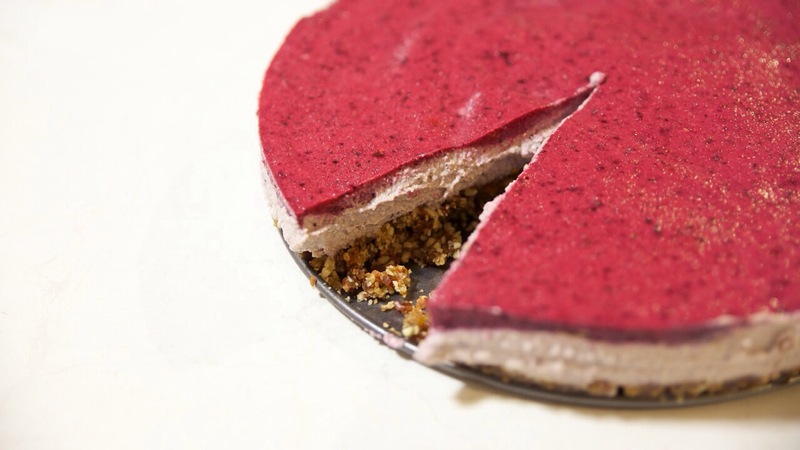 Raw Tarts are all the rage at the moment…. I think the vegans are largely responsible. That’s not a dig at vegans, I love this raw tart business. There is a lot of raw vegan ‘something-or-another’ kicking about in health food cafés & shops, it’s the new black, all the cool kids are doing it so I thought I’d best dip my toes in too…. To the concept, not the tart. I wouldn’t put my feet in the tart, that’s just unhygienic. Add the base ingredients to the food processor & blend until it forms a mixture that forms a crumbly dough. It should hold together if you pinch some between your fingers. If it’s too dry, add a couple of extra dates & an extra tbs of coconut oil. Remove this mix & press it into the base of a springform or tart tin. Set this aside. Add the cashews & coconut cream and blend in the food processor until a smooth paste forms. Add all remaining filling ingredients & blend until smooth. Adjust the sweetness as you need to. Pour this on top of the base & pop it in the freezer to start to set while you make the topping. For the fruit layer blend the berries & gelatin until smooth. Pour it over the top of the tart & return the tart to the fridge to set for 3-4 hrs before slicing. « Are You Already Merrymaking?